By 1 pm Louisiana time, permission had been obtained from Admiral Landry to go ahead with the top kill procedure. The team is therefore waiting for final approval from the top folks at BP, before going ahead. There have to be concerns about the increasing number of leaks at riser near the BOP, which is lowering the flow out of the end of the riser (and which were visible on a CNN feed earlier this morning). Leaks of a fluid that is carrying abrasive particles can get larger very quickly, and can threaten the integrity of the BOP. This now, therefore, becomes a driver to accelerate the process, given that if the flow is allowed to continue that the BOP may be further eroded and weakened and may collapse on the one hand, and that even if it were not to, that the resistance to the pressure of the top kill process will decline as it erodes. We are at a point where endless discussion and the need for permit after permit begins to have a negative impact on success. UPDATE - Well so much for impatience, the process has been started, and we should know fairly quickly whether it works. UPDATE 3: Well BP said that they would provide a live feed, they just didn't say which one - grin - so the feeds are now showing things such as parts of the BOP, where they were looking for leaks initially, but where nothing much is now happening, But it does seem from the occasional glance of the leaks near the top of the BOP that they are increasing the pressure on the feed to the well at 2:30 pm. Hmm, now CNN are showing the top leak, and if you look at the one at the back, it noticeably got bigger in the last couple of minutes. UPDATE 4: (3 pm) BP are planning on injecting 50 barrels of mud a minute. Let us assume that the leaks are still allowing 5000 bd of flow, which is equivalent to 150 gal/min. 50 barrels at 42 gallons per barrel is 2,100 gallons. Let us assume, for discussion that the amount that escaping fluid through the BOP doubles during the injection. Then the flow that will go down the well is 2,100 – 300 = 1800 gallons. There are 231 cu inches in a gallon. So they will be injecting 416,000 cu inches/minute. While the well has various diameters I will assume a diameter of 16 inches as an average. This gives a cross-sectional area of 200 sq inches (roughly). Then the speed at which mud will travel down the well to fill it is 416,000/ 200 = 2,080 inches per minute, or 172 ft per minute. The underground part of the well is 13,000 ft deep. At 172 ft/minute, it will take 13,000 / 172 = 75 minutes to fill the well with mud. So that is about as fast as the operation can determine success. Though, due to pausing between steps to ensure that there aren't too many problems, it will likely be somewhat longer. And it depends on how much worse the leaks at the top of the BOP get. UPDATE 5: There is nothing really exciting about watching a mud fountain play into the ocean for an hour or more, and so I thought I would stick my neck out a little and predict how this might end. (Nothing dramatic being visible, means that so far it is working). Once they consider that the well is full of mud they will likely back off the pump pressure that is injecting mud into the well. 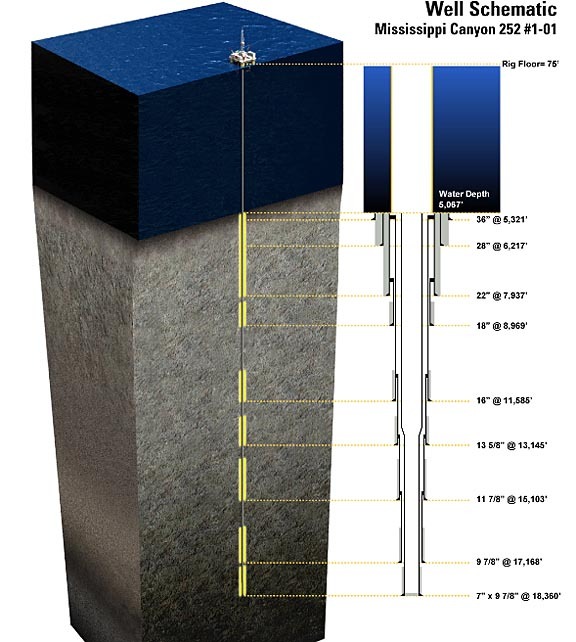 They will monitor the pressure in the well as they drop the inflow pressure down, and watch to see, as the pressure falls, if there is any increase in pressure from down hole. If they can take the pressure of the pumps all the way down to ambient (which is under 5,000 ft of sea water, and is therefore around 2,400 psi) and stop injecting fluid, and nothing changes on the pressure gages, and there is no flow out of the well, then the well will have been brought under control. As the pressure in the pumps starts to fall, so the mud fountains at the leaks will start to diminish. UPDATE 6: Well I notice that the BP Press Conference keeps getting postponed, which may be good or bad news. If the Top Kill had immediately failed (unacceptable erosion of the BOP) then there would likely have been a Press call. If it had immediately worked then there might have been another, but that they are delaying it means that it may be working but a little slower than they had hoped. UPDATE 7: Ah, in the Press Conference Doug Suttles said that they are only injecting mud at the rate of 20 barrels a minute. (7,000 barrels over 6 hours). This is less than half the anticipated flow (50 barrels) and they may have dropped the injection flow rate to keep pressures in theleak above the BOP at an acceptable level. That does increase the time it will take to fill the well significantly (by several hours, depending on the leak rate). Though it also shows that those estimates that the well was leaking at 100,000 barrels a day were fantasy. It would take 87.5% of the mud injected being lost to leaks, for it to take 22 hours to fill the well, and that would indicate that the leakage rate was 25,000 bd. I was watching CNN and Campbell Brown talked over what the biggest problem has been so we'll have to wait until either a reporter or the transcript lets us know. UPDATE 8: Well it may be my old eyes, but I think that the flow from the leaks is definitely less than it was, leading me to suggest that the well is now full of mud, and they are reducing the flow to see if the well behaves. (8:47 pm) I haven't been watching for a little while however, but did have these other thoughts before I got distracted (its called dinner if I recall). UPDATE 9: Well the picture is clear again (wonder if they used an ROV backwash to remove the mud?) and I have been sat with an earlier picture of the leak flows, relative to the current picture and I still think, from the lowering of the points at which the flows bulge out, that the jets aren't at as high a pressure as earlier. This could, however, be because the cameras have moved, or changed lenses, but the pictures do have several common features. And the heights of the plumes from both side jets are significantly lower. (In fact by 9:45 the back one appears to have disappeared, while the main central flow is noticeably less powerful). UPDATE 10: Looking at the flow now, relative to the earlier pictures it does definitely seem to be reduced. So I would suspect that they have reduced the amount they are pumping in to balance against the leaks, while they monitor the pressure in the well and see if there are any problems develop. If there aren't any (and their chance is reducing) then the plan was to inject cement and create a plug. No-one has mentioned how much of that they have available. BP Stated they won't know results for 24hrs. Does this mean they will pump mud for the next 24hrs? No, once they get the mud in place they have to check to ensure that the well is stable. They are unlikely to cut back on the amount of mud they are injecting, but we don't know how much is escaping. If it is more than they had anticipated, then the fill rate will slow and it could take significantly longer that the simple calculation I did above. OK - another question on the hypothetical of failure: Is it possible for BP to just keep pumping mud until the relief well is finished? Would that work to at least stay the flow of oil? They would need a huge amount of mud, and probably couldn't keep the flow rate up. (there is already some additional erosion at the BOP - see my 8th update) But I begin to suspect that this will remain a hypothetical question.